Busch Gardens Williamsburg to build a new coaster for the 2020 season. New plans came out involving Busch Gardens Williamsburg and a new coaster coming to the park for the 2020 season. Not that many details have gone out yet but the slide seen to the left gives us some basics. Opening in May of 2020. Rider height of 54 inches. Fastest Launch in Busch Gardens Williamsburg. A multi-launch coaster that will top speed around 76 MPH. Going into the Italy section of the park. The final drop will be seen from the Italy bridge. Our friends over at BGWFans also released this teasing image at an internal conference on March 19th. Teasing the roman numerals for '2020' and confirmed the location to be Italy. Along with this, it was strongly hinted at this ride having a 95 degree drop! 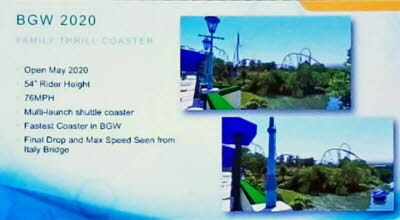 Multiple elements will be involved with this coaster, including a long drop into the Rhine River Valley, over-banked turns and multiple launches. New pathways, lockers and even a bridge going over the Festa train station will also be included with the construction process. Finally, we now know why Busch Gardens was doing all those height servery's in the 2017 season!